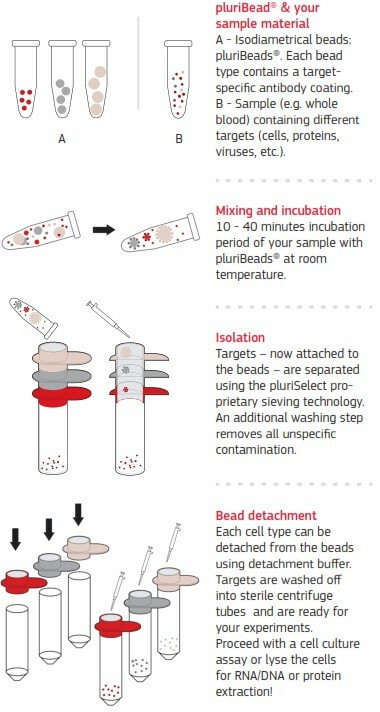 pluriBead is an innovative separation technology for the isolation of cells, proteins, viruses, bacteria and a variety of other targets from whole blood, cell culture, cord blood and other heterogeneous biological fluids. The tools are versatile in application and form the basis of research in cancer, rheumatic illnesses, arteriosclerosis and allergies. Any starting material:whole blood, buffy coat, PBMC, tissue homogenate, etc. 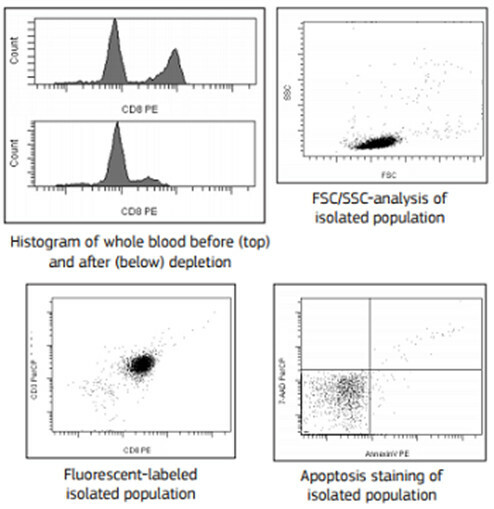 Cell isolation for gene expression and protein analysis:RNA and protein profiles of cells change over time after blood sample collection. pluriBeads allow specific cell isolation in physiological conditions within 10 minutes, thereby minimizing cell stress. Cell isolation for cell stimulation and differentiation: pluriBeads provide a gentle cell separation method to preserve the cell’s differentiation potential. Multi-target cell separation:Different bead and sieve sizes can be stacked together, allowing separation of multiple cell types in one cascade. 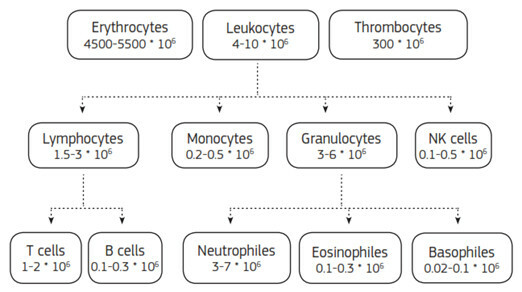 Up to 6 targets can be isolated from a single sample. Ready to start? 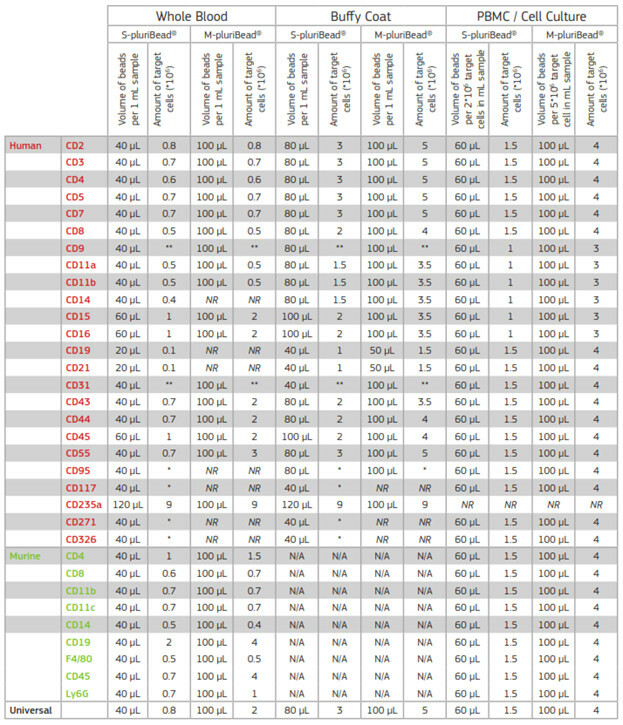 See our Product Selection Guide. pluriBead is an innovative separation technology for the isolation of cells, proteins, viruses, bacteria and a variety of other targets from whole blood, cell culture, cord blood and other heterogeneous biological fluids. It is non-magnetic and utilizes a sieving mechanism for target separation. The Reagent Kit includes all accessories (strainers, buffers, plastics) that you will need in addtion to the pluriBeads. Choose a Reagent Kit based on the size of your pluriBeads. Follow the user manual and isolate your target in less than an hour!